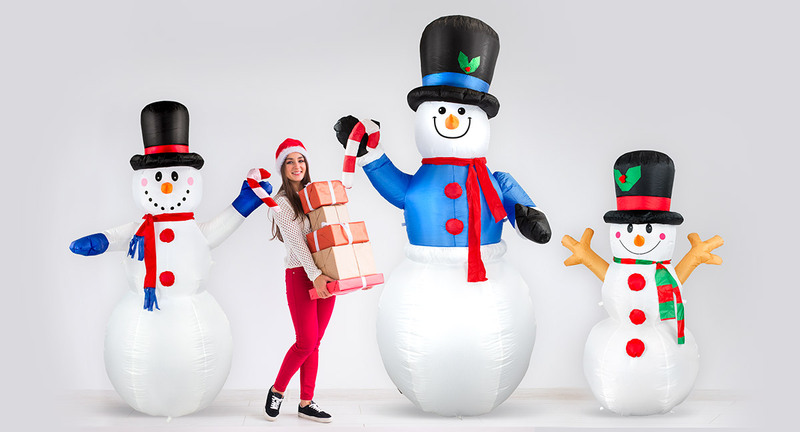 This 10' ft Three Stacked Snowmen Light Up Christmas Inflatable By Comin™ makes an eye-catching outdoor lawn decoration. It's simply the perfect combination between simplicity and bold, with the two complementing each other perfectly. Added on is the wear-proof design, which improves the ability to last. Instead of one lonely snowman, this Christmas inflatable brings three snowmen stacked on top of each other together. What's more, the snowmen are actually great friends. They are all smiling and waving. This inflatable is perfect for any lawn or porch to greet people passing by with holiday cheer . Adorned with adorable scarves, hats, and buttons, these snowmen look more festive than ever. In addition, the high-quality manufacturing of this product means that these buddies are going to stick around for quite a while.